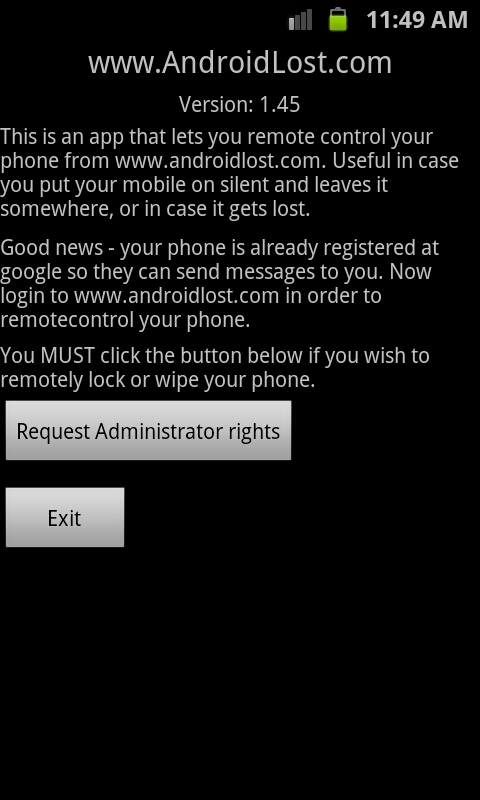 AndroidLost is a free Android App which help you to control and recover your Lost Android phone from your PC. It helps you to sound an alarm on your Phone, send a popup message to your Phone, view the location of your phone on map, read SMS inbox and sent, wipe phone and SD Card, Enable wifi and GPS, take the picture with front camera and forward incoming calls to your new number. It has lots of features that help you track and recover your Lost android phone and control the device from your PC. One of the best and easiest way to track and remotely control your android device. Download the AndroidLost App from the Android Market (Google Play) and install in your Android Device. Now launch the app and select Request Administrator Rights and Activate it. After the installation of app on your Android Device, it’s time to visit Androidlost.com website and Sign in with your Google ID that you are using in your Android Device, then navigate to the Controls page. Now You can see lots of Option there Like Alarm, Location, Status, Messages, Security, Mobile. In Alarm option you can select the duration time of Alarm. This feature can start alarm on your Lost Android Phone. Next feature is Location, here you can find the location of your phone on a map. Even if the phone is indoor you will get a nearby location by network accuracy. Click the Send Location button and within a few minutes you will get the Map on your Gmail Account. 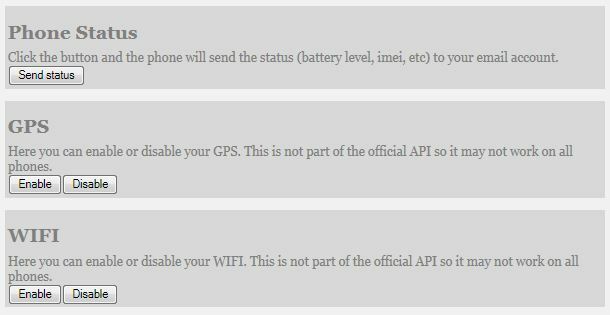 On Status page, you can get all the details about of your phone like battery level, imei, etc and Enable WiFi and GPS. Click the button and the phone will send the status (battery level, imei, etc) to your email account. 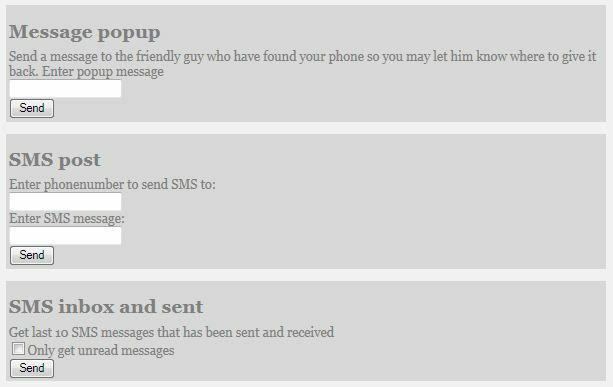 At messages feature you can send a popup message to your Lost phone. You can also send SMS to any phone number from the PC and also received the mail of the last ten received and last ten sent SMS to the registered Gmail account. 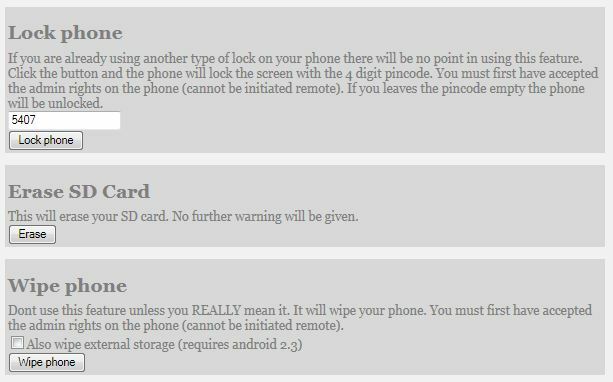 Here in Security feature you can you can Lock your Phone, Wiping Your Phone Remotely and Erase all the Content for your SD Card. You can lock and unlock the phone from the web. If you forget your pincode you can simply overwrite it or remove it by entering an empty pincode on the web. 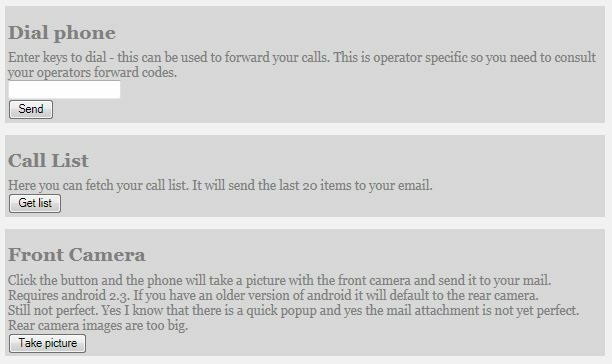 At Mobile section you can get the last 20 call list on your mail box and also forward the call to another number. One feature we like it here is Front Camera. The phone will take a picture with the front camera and send it to your mail.